If you are looking for a quality fence for your dog or horse, look no further then Best Friend Fence! 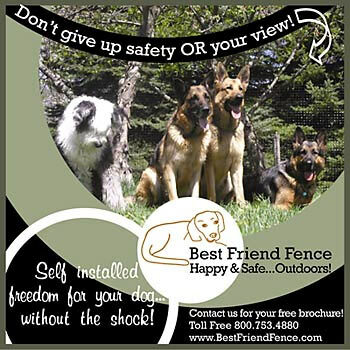 Best Friend Fence is a division of Benner’s Gardens, Inc., a family owned and operated national mail order business that has been providing virtually hidden Deer Fencing systems to home gardeners and landscape professionals for the past fifteen years. As homeowners began to protect their valuable landscaping from hungry deer, increasing numbers of these customers also began to simultaneously utilize our Deer Fencing as a highly effective dog enclosure. With very positive feedback being generated from satisfied deer/dog fencing customers, Benner’s decided to begin offering the “Best Friend Fence” exclusively as a dog fence. To date we have several thousand extremely satisfied customers that are using our material, and the numbers grow every day. As we continue to grow we now offer a horse fence, which should be combined with other types of fencing such as split rail or vinyl to be most secure and effective for horses. Our Best Friend Dog Fences Kit includes everything needed to easily create visually unobtrusive and completely safe and enjoyable outdoor dog fences for your pet(s). Posts, ground stakes, zip ties, and detailed instructions along with fencing in various heights and lengths (see roll size description in each dog fences kit) are all part of each kit. All you need to know is the linear footage of your proposed fence line, and how high you would like your fence to be - then just select the appropriate dog fences kit. We have the perfect fence for you whether you have a small dog or whether you have large dogs. Please visit our website for complete information about our dog fence kits! At Best Friend Fence we provide a durable and safe horse-fencing product at an affordable price. It is important to us to provide the best materials available to make sure that your horses stay within a designated area of the horse fencing and to keep other animals out. With our experience with other dependable products such as dog fencing, deer fencing, and rabbit fencing, you know that you will be counting on a company with knowledge and the experience necessary to create a great product. Our horse fencing is no exception. Mesh horse fencing is designed to keep predators off your property while keeping your horses safely contained. This fence should be combined with other types of fencing such as split rail or vinyl to be most secure and effective for horses. If you have dogs or other animals that you are concerned about then our horse fencing is definitely the right decision for you. Our friendly staff at Best Friend Fence can assist you with setting up your horse fence. Benner's Best Friend Fence is a fantastic idea. Having just moved to Virginia with 3 dogs, I had no idea how to keep the deer out and the dogs in. The fencing is virtually hidden, and we were able to put the entire fence up in a few hours. Benner's offers quick delivery and wonderful service. I would highly recommend their dog-fencing product. Order Your Best Friend Fence Today! Our friendly staff at Best Friend Fence will be more then happy to assist you in getting the perfect fence for your unique needs. Whether you need a fence for your dog, horse or a fence that takes care of both we have what you need. So what are you waiting for? Call us today!